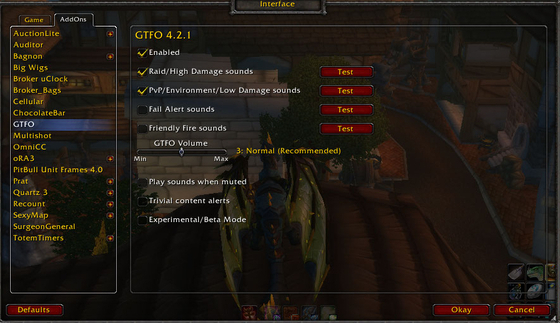 GTFO is the best addon you’re probably not using right now. GTFO stands for exactly what it sounds like, “Get The F$%# Out”. Simply put, the addon gives you an audio alert whenever you are standing in something that is causing you harm. Why is this a good thing? Well, right now there are a lot of area effect boss damage abilities that still can hit you even if you are “in the clear”. Take for example Valiona, both in Grim Batol and Bastion of Twilight. The dragon has a frontal cone breath that causes massive amounts of damage if you sit in the fire. Many times I’ve been outside of the visible effect, yet still took the damage as if standing in it, didn’t notice at first and became so much Dwarven BBQ (I can admit when I fail :]). After installing the addon though, this just isn’t a problem anymore. It plays a subtle, yet noticeable, tone to indicate that I’m standing in bad. I’ve always been a bit of an audio queue player. Even with my boss mods and power auras I’ve always set sounds to alert me to what’s going on. Personally I find it a lot less intrusive than visual cues, since most of my attention is on the health of those around me, and staying alive through boss mechanics. The less I have to tear my eyes away from the fight and their health totals, the better off everyone is. The addon allows you to set thresholds for sound, and adjust the various audio alerts so you can customize the experience. The sounds the addon come supplied with are distinct and different enough from those provided by Big Wigs, Deadly Boss Mods and DXE that it is quite distinct and can be picked out easily among the cacophony of other sounds and it even has the ability to integrate with Power Auras to give a visual notification of when you’re standing in bad. Setup is pretty easy as it works right out of the box. After installation if left alone it will simply buzz an alarm in your ear whenever you are standing in something that is causing damage. Now, it won’t only buzz once, it will continue to buzz and make noise until you are out of the area taking damage. Honestly that’s better than yelling at any raider to get out, because you don’t have to clutter mumble or vent with your lamentations of raiders standing in fire. The mod itself is pretty lightweight, so it won’t break the memory bank or cause any sort of disruption. Let’s face it, sometimes we get tunnel vision when raiding or running any form of content. How many times have you be so focused on squeezing out that last heal or that last little bit of DPS and missed the bad headed your way? It’s happened to us all at least once. This addon though, this little sound chiming in my headphones to let me know I’m missing the fact my kilt’s on fire, has helped keep me alive through many, many fights. I think this addon is well worth the pick up if for no other reason than to test it out. As an added bonus to raid leaders, if your group is running the mod, recount shows the number of audio alerts people receive so you can also double check to make sure that they were responding to the alerts or standing in the good, not the bad. Give it a try, have your raiders give it a try, you may fall in love with it just like I did. Last week I started a mostly regular Saturday feature whereby I do My Thing for you guys here at WoM. No,that’s not putting on a light display shooting lazers from my eyes. Embarrassingly I’ve generally switched raiding mains as it is and am considering switching again (shh, don’t tell Matt), so lazers are much removed at present. But what I do do is gather the best posts from around the WoW blogosphere and deliver them straight to my readers at my website, MMO Melting Pot. And that’s what I’m doing on a Saturday: rounding up the best posts I’ve read during the week, with a focus on the posts about healing, leading or raiding so that they’re just the right cup of tea for WoM readers. Things have been a little quieter in the blogosphere this week, particularly on the healer-chatter side of things. Y’see, the end of October hails, well, November. Many bloggers are focusing on preparing themselves – or their guilds – for Cataclysm. Some are blogging less because they’re focusing on the now traditional (inter)National Month of Novel Writing (NaNoWriMo). Some, well… what can I say. It’s Halloween. We’ll just have to send search parties out if they don’t come back after midnight tomorrow. But all of that doesn’t mean there’s nothing going on in the blogosphere at all. Tumbleweed hasn’t come to town by any means. Some people may be battening down the hatches against the coming storm but a lot of them are still writing. Heck, some of them are even creating a whole new website. What do I mean? Let’s take a look at that – and more – as it’s all fairly exciting. Brangwen: new site for MMO leaders – great news everyone! 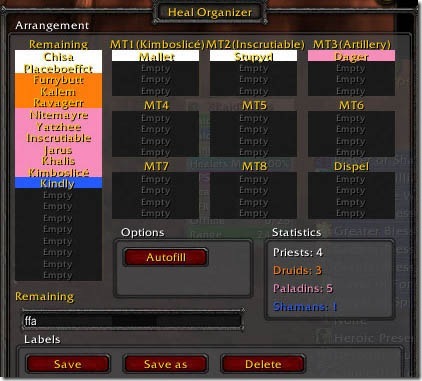 Brangwen of Non-Elitist Raiding Diary revealed that she and several others from all corners of the blogosphere have started up MMO Leader: a home on the internet for MMO leaders. If you’re in any kind of leadership role – officer, guild master, raid leader, class leader, you’re welcome to go on over there and join in their forums as much as you want to. They also have articles for your leadery-perusal. And yes, you can give writing your own articles for the front page a go, too. It’s fantastic that us leaders finally have a place to rally in. Seeing the Forest for the Trees: Beta Healing – Vixsin at Life in Group 5 says that healing is going to change in Cataclysm: it’s not going to be anything like what we’re used to. She says we’re going to have to adapt, and gives 7 points of what’s going to change for us. That sounds like a taster, mind – from what she says, everything’s changing. But there is hope. Vix rounds off the post with an excellent call to healer-arms (granted that’s more likely to be sparkles of light) and reminds us that we can do this – it’s why we’re healers. Beruthiel: How To Prepare Your Guild For Cataclysm – any expansion’s a shaky time for a guild, and Cataclysm even more so with its guild talents. So Beru’s survival guild is essential advice for any guild. Her guide is lean and gives you exactly what you need to know to get your guild rolling for Cata, from tips on what to say to members to when to do it, and how to keep morale up. If you’re a guild leader, you’ll likely get some ideas from her. if you’re a member of a sleepy guild, maybe wave it at your officers – you might inspire them to get moving! A Priest’s Guide to Chakra Healing – this is for holy priests out there, fresh off the press from Derevka at Tales of a Priest. He’s going through the chakra mechanic, explaining its two different states and what you’ll be using them for. He also looks at how to change chakra states and gives helpful tips about how to track which spells you have available to you, when. A learning curve? Yes, Derevka says, but one that allows holy priesties huge flexibility. Fresh Brew: Addons That Help You Inspect People, Run Guild Raffles And Set Fire To Things – our addon roundup this week might well be useful to you. There are a couple of guild related ones in it, such as one that allows guild officers to use the new in game flares more easily and another that’ll let you set up guild raffles for fun and giggles. That be it for this week. I hope this lot keeps you entertained over your morning coffee. Or your evening meal, or brunch, wherever you happen to be. ‘Til next week – have fun, and don’t let the midnight horrors bite! What do you think – have you got more to say about any of these articles, or even another article to contribute to the list? I’m sure you’ve heard the news by now. In patch 3.3.5 Blizzard intends to intentionally break AVR/AVRE. It is not the first time that something like this has happened, but it does strike me as a bit odd as to the reasoning behind it. Now don’t get me wrong, I’m not saying that they are wrong to not want to see mods like this disabled, but they claim it is because of the invasive nature of the mod and that it allows altering and interacting with the game world. Well, we interact with the game world all the time don’t we? We kill a mob, that’s interacting right there! Silly statement I know but it is the truth. Simply by being in the world and playing the game we are interacting with the world and on some level altering the state of play for those around us. As far as calling it invasive or that it alters the game world, I don’t know. Is it any more invasive than any other boss mod? Take a look at most boss mods, they mark players that are affected by effects, provide warnings both visual and audio before a boss does an ability and effectively simplify encounters. Some even give you arrows telling you where to run from an effect, others include range finders to tell you how far away you are from other players in order to avoid making some boss abilities chain or augment. Mods like Auctioneer allow you to alter the way you interact with the auction house, postal allows you to modify how you access the mail in the game world, power auras allows you to be notified of every single buff and debuff in the game and mods like grid allow you to alter how you view the members of your party and allow you control over what information is filtered through and omen alerts you to threat compared to all other party members. So what makes AVR so taboo? I was thinking about it and it reminded me of a funny story from my pen and paper days. I was playing Dungeons and Dragons (tabletop pen and paper version) with a group of friends. Our party was supposed to set up an ambush to take out a band of mercs about three times our size. I was playing a halfling rogue at the time and was the party’s wet works guy. I would sneak around, spy on things and help set traps. Our fighter in the party was a tactical genius (the player has since moved on to a military career and it is very fitting for him as he honestly was a huge strategist) and came up with a plan that involved key movements at key points in time. My character happened to have a bunch of chalk, and came up with the idea of setting markers on the walls and floor to indicate thresholds for those lying in wait. It could indicate when to attack and after a point when to break off and regroup or attack from a different direction. The fighter loved this idea, and we set about marking the ruins we were using as the kill zone in markings the party would understand. We then set various traps and waited for our ambush to take place. As the mercs entered the ruins we watched from hiding as they breached the thresholds, we attacked. The mercs moved past another marking and we dove back into hiding and onto the next position. This continued until the band was no more. We took no casualties and had a well executed plan thanks to a series of chalk markings. The GM joked at the time of having allowed us to have such general items and them coming in so handy. So, is AVR so different than the chalk we used in that game session? I don’t feel that it is when used to say, mark spots on the ground for people to collapse to or stand at during certain encounters. On a personal level I will miss it not because of anything it did during a boss fight, but I truly loved the way it interacted with Totem Radius in showing me the effective range of my totems in real time. That said I wont lose any sleep over it going away, but I think Blizzard may have been a bit hasty in their aggression towards this mod. Personally I don’t feel it is any more invasive than any other mod they currently allow in the game, and honestly once you allow mods or addons of any sort you are inviting a sort of intrusion into that which you created. Did it make things too simple and remove player thought from the game? I don’t think so either, I’ve seen enough people with it installed still mess up quite frequently. It was not a guaranteed win for boss fights otherwise we would see a lot more people having downed ICC heroic mode when using this. In the end a mod is no substitution for attentiveness to the game and player skill. This one just happened to let us John Madden things a bit, and occasionally draw funny objects where they don’t belong. So what do you think? Do you support Blizzard decision to break the mod? Do you think it made things too easy? Will you miss being able to draw stick figures randomly in ICC? I hesitated a bit when writing this post largely because I know how the community feels when it comes to “scoring” players. No one wants to be condensed to just a number or a value. 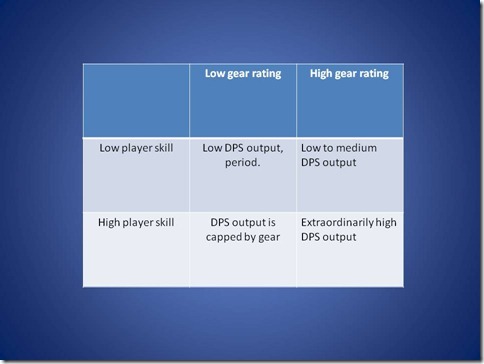 At the same time, the idea of a player’s gearscore has evolved to into another concept where a players capability and potential can be scored. Why rate players at all? Its a good question. For raid leaders who are assembling their groups from strangers, it can be a bit of an exhausting process to individually armory players and figure out if they can compete in the level of content that is being worked on. At the same time though, not everyone knows the strengths and appropriate stat weightings of every class or spec. I’m a healer. I don’t know much about Rogues or Hunters. I don’t know how to tell if they’re gemmed or enchanted properly. When raid leaders are getting runs going, they have to balance two things: Players and time. We need to make sure we get ourselves a competent crew to run with. We need to make sure that we can assemble it within a reasonable amount of time or else people will simply leave because of time constraints. Between inspecting players, asking questions, and achievement checking, that time can add up especially when players get turned down. Gearscore currently examines a players gear and assigns a value based on the overall “power” of their items. It doesn’t know whether a player enchanted or gemmed their gear wrong. It isn’t smart enough to determine whether a Ret Pally wearing cloth instead of plate should get penalized. Gear does not determine player skill at all. But it does determine the maximum damage, healing, or tanking a player can do. 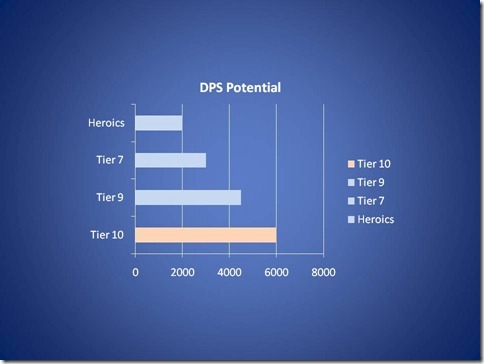 Let’s use a DPS player as an example. The above table represents in my mind the two qualities I look at when bringing in a player. Gear: Like it or not, gear ultimately determines the range at which a player can do damage. The better the gear, the higher the potential. They can still do low damage even though they have competitive gear. Skill: You can’t look at the skills of a player until after you run with them at all. Personally, I like to assume the best. I’ll rely on their achievements for a better look. While its true that people can get carried when clearing Trial of the Crusader, its difficult to say that when the player in question has killed Anub’Arak on Trial of the Grand Crusader. Both aspects are intertwined to a degree. These are extremely rough estimates and I know that encounters will have a huge determining factor in the overall DPS that can be done. Its also going to vary by class mechanics and so forth. Lets just assume for the second its the same player on all four characters with different levels of gear. In all cases, he could do 1000 DPS. Maybe this Elemental Shaman would bind Lightning Bolt to every key and just faceroll all over it. But if the player is using every cooldown and nailing every rotation, then what restricts his damage is his gear. 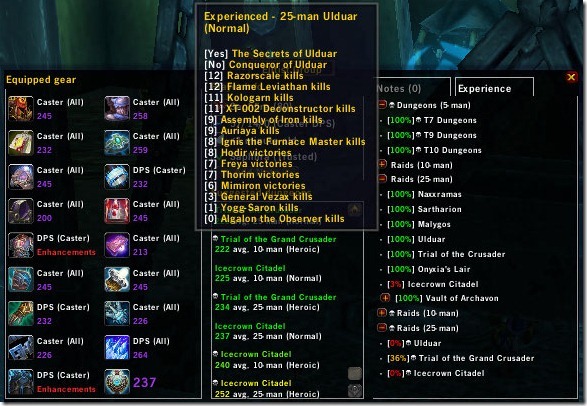 Only one set of gear is going to allow Elmo, the Elemental Shaman to do or exceed 6000 DPS. Its all about potential. I wrote about this on No Stock UI this morning, but I wanted to mention the usefulness of this tool to raid leaders and what type of information I’d glean by looking at this. This is the sheet of my Retribution Paladin, Valoray. Its a bit outdated. I picked up a new cloak and chest and haven’t gotten around to enchanting either of them. Anyway, according to Elitist Group, I’m using a tanking Libram (really?) There are a list of suggested dungeons down the middle that I can participate in. EG has tallied up what I have along with the gems I have and has assigned me a gear rating of 239. This means that my Paladin is theoretically able to compete in Icecrown Citadel raids as long as they are not heroic. But what about my skills and my experience? Over on the right pane, you can see the list of raids and achievements that I have completed. No hard mode achievements. Fully cleared Trial of the Crusader. Made some slight progress in Icecrown Citadel. Didn’t knock out Ulduar entirely. This Paladin fails. Lets move on to someone else. And here we have my Elemental Shaman. Still using that Deathchill Cloak. EG has red flagged my chest and legs. I’m using spellpower and stamina gems in them. And my legs are also using the spellpower and spirit leg enchants. What a terrible Elemental Shaman. Glyphs seem to be okay (although I heard Glyph of Totem of Wrath is making a comeback?) A gear rating of 237 indicates that my Shaman is slightly less powerful than my Paladin. But what about her experience? Mousing over the Ulduar 25 raids, we can see that the Shaman has at least 1 Yogg-Saron kill under her belt. She meets the EG recommendations for Icecrown Citadel on 10 and 25. She even has 36% completed in Trial of the Grand Crusader having taken down heroic Val’kyr Twins twice (although to be fair, that group lucksauced it with the door strat). Given the choice, I’d probably pick the Elemental Shaman because she has done a bit more in the game then the Ret Paladin has. In any event, use Elitist Group. It condenses most of the information you need into one accessible place. You can see what they’ve done and get an idea of what the character is ready for. To a healer like me who doesn’t know enough about other classes to make snap judgments, this advises me on whether or not I should outright reject a player or consider them. Then again, I rely on other experienced players to handle the inviting :D.
You know the old saying timing is everything right? Well it’s very true for healing. Bad timing can cause a dead tank, or a wiped raid. Management of global cooldowns, spell cooldowns and compensating for lag can make all the difference in the world between a bad healer a so-so healer or a good healer. So, how can we deal with these as healer? Well there are a couple mods that I’ve found quite useful for dealing with this. 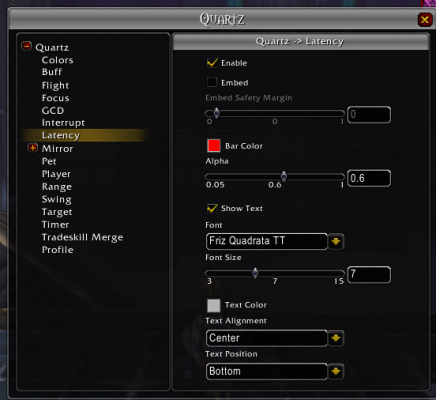 Quartz is a casting bar mod addon that replaces the default Warcraft one. It is highly customizable and is very useful for help with compensating for latency. That’s a picture of it in use. 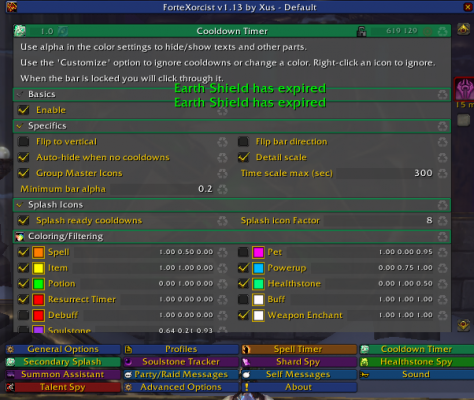 The icon of the spell is displayed to the left of the bar and the bar shows the time left on the cast, as well as the estimated time of completion. In this case you can see that my Lesser Healing Wave was taking 0.9 seconds to cast, and had 0.1 seconds left before it completed. I couldn’t get a good picture of it, but it adds a latency marker at the end of the casting bar. It’s a red block with with the latency added in on the bottom of it. You can see it slightly at the back end of the 0.9. You have to enable the feature in the options for the addon, but once you do you’ll be good to go. It will compensate for whatever latency the game has, and anytime you see your cast bar hit that red block, it’s safe to hit another spell and have it begin to cast when your current one is done. This is useful for many reasons, chief among them is to keep your heals streaming without interruption. Nothing worse then hitting a heal and not have it start to cast, only to find your tank or DPS dead as a result. The mod is highly customizable in look, size and what it shows you. It can show you everything from your own global cooldown, how long is left on an interrupt on you as well as function as an enemy casting bar display. If you haven’t taken a look at Quartz, you might want to. Fortex is a mod that tracks quite a bit of information for you. At first glance you’re probably saying to yourself “but that’s just for warlocks”, but I can assure you it’s not. The mod has an options for every class’ cooldowns in the game. It can show you debuffs, soulstones, buffs, even trinket cooldowns. I’ve also found this very handy on my Death Knight and my Hunter. Since installing it I can tell you my healing has gone up as well as my DPS on my other toons. Knowing when your spells and trinkets are available and using them as quickly as possible can make a tremendous impact on your healing and damage output. This mod definitely helps me get the most bang for my buck out of my spells and trinkets. Having a mod that helps you compensate for your latency and one that can help you manage your cooldowns is incredibly useful. There are many out there, I suggest taking a look through all the ones that are available and find ones that work for you and fit your play style and your User Interface. I just happen to have found these two mods quite useful in this endeavor. Here’s a picture of how these two mods fit with my UI featuring my friend’s lovely pet Gertrude tanking Chillmaw for us. So what about you? Have you found any mods that you find useful for managing your cooldowns? How about a good casting bar to help compensate for latency? Say Hi to No Stock UI! During the summer of 2007, I started World of Matticus. 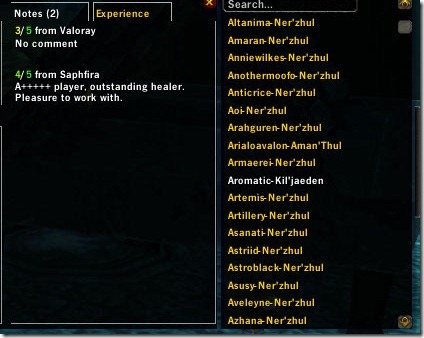 In the summer of 2008, I opened the PlusHeal discussion community for healers to take part and actively contribute their ideas for other players to learn from. It is now spring of 2009. You can find out more about us if youÃ¢â‚¬â„¢re interested! YouÃ¢â‚¬â„¢re also certainly welcome to contribute! WeÃ¢â‚¬â„¢re all UI enthusiasts at heart. No doubt some of you are wondering whatÃ¢â‚¬â„¢s the point in a UI blog. But some of the most passionate and heated blog posts stem from bloggers who write about their UI and different addons. Often times these useful posts are scattered, buried and tossed aside never to be read again. To start with, the blog will be updated every Tuesday and Thursday. Hopefully we can pick up the pace as time goes on. Eventually, IÃ¢â‚¬â„¢d like to see it get to the point where readers can get a new post everyday. One step at a time, right? Hope youÃ¢â‚¬â„¢ll enjoy reading our posts as much as we loved writing them! Welcome to the fourth in a 5 part series here on World of Matticus. For the next several weeks, I?ll be covering the rare topic of assigning raid heals. No one really wants to do it but it?s the most important job in the raid and I?ll provide a basic overview of the process and some advanced tips! Yeah I slacked off for two weeks. Bad thing to do when writing a series. But I have an excuse! We’ve called our raids until the start of the school year and I couldn’t very well post healing assignment stuff without actual screenies now could I? 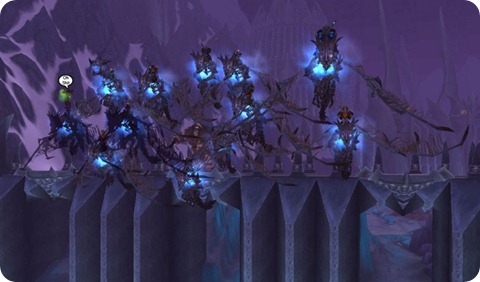 When it comes to raiding addons, players will typically use one or the other. Most players would never dream of mixing and matching addons because it feels redundant, it’s a waste of system resources, and it would add to the overall general clutter of the screen. For assigning healing, we are blessed with a wide variety of addons to make our life easier than healing a full T6 Prot Warrior with the Bulwark of Azzinoth carrying the flag in Warsong Gulch. 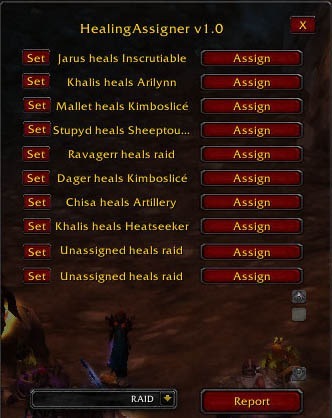 Anyway, there’s a multitude of healing assignment addons that we can use to help quarterback and direct our healers in raids. But who says we’re restricted to only using 1? Why not use more than 1 for different parts of the raid? Before the days of addons and mods and all these funky gadgets that make our life easier, healing QBs used to rely on the tried and true method of pen and paper in order to organized their thoughts. After they’d come to a satisfactory list of who-heals-who, it would then be painstakingly macro’d and transmitted in game in WoW. Thankfully, we don’t have to do that anymore. And now, onto the choices! I did try using Heal Assign for a while but I quickly shelved it in favor of using Healing Assigner and Heal Organizer. 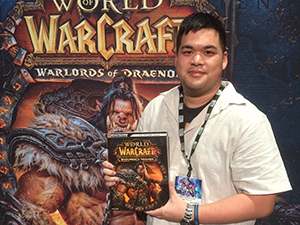 The two-addon method is especially effective in multi-stage encounters like Illidan and Leo. There are times when you have to change up the tanks or the tanks healers to adapt to the different parts of the fight. 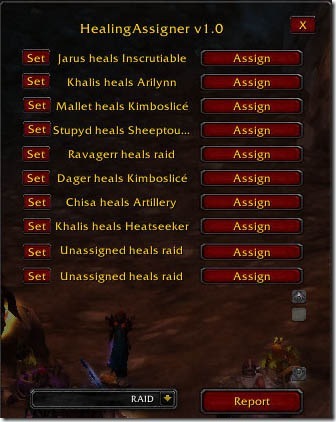 If the bosses have been on farm for a while, then I’ll set up Heal Organizer for trash healing orders really quick. Note how Heal Organizer automatically pulls the list of tanks from the MT list. It saves you the effort of having to pick out specific targets. Each tank is limited to 4 healers. It doesn’t appear to be possible to assign crosshealers . For example, I am not able to assign myself (Mallet) onto Kimbo, Inscrutiable and Artillery. The raid that this shot was taken in was a Gruul’s Lair pug. The total amount of possible healers we have 13. This is incorrect as we were packing 6 (or it might have been 7). The addon does not differentiate between specs. In other words, you might end up having Ret or Prot Paladins as well as Feral Druids and Enhancement Shamans clogging up the list. You need to be aware of the individual specs that these players are in order to be effective otherwise your raid will be in a world of hurt (and surprise) when that Feral Druid is assigned to healing. Now that we get to the actual boss, things become a little more complexicated. I have to make sure there’s enough heals to go around. I need to make sure that the right tanks get the heals that are proportional to the amount of damage they take. I’ll end up stacking 2 – 3 healers on the MT (2 direct healers, and a HoT class). In this case, I picked a Priest and a Paladin to take care of our main tank (Kimbo). The Shaman was going to be kited by 2 Hunters. Remember the Shaman boss only focuses on one target before he Polys the guy and peels off to another one. I assigned one Paladin to heal both Hunters (Khalis). Our Mage tank, Sheeptoucher, would be healed by Stupyd, one of our other stronger healers. The rest were filled out accordingly. The thing about using this mod is that you have to physically click and target members within the raid. Pick the healer first then press Set. Pick their assignment, then click assign. If no one is selected, it will default to either ‘Unassigned’ or ‘raid’. Between this and Heal Organizer, I use this mod more frequently as I’m given much more flexibility and control in what I need to do. The inability for it to save certain profiles means I have to reconstruct from memory who I assigned to whom last week. That’s the one main criticism I have. It’ll end up taking me 3 – 5 minutes at a time per boss fight. Tip: Start setting up your healers on the boss about 2-3 trash pulls before you get to the boss. Here’s what the 2 mods look like when echoed in raid chat. A lot more straight forward, Healing Assigner will simply spit whatever you throw in there out into raid. If someone forgets, you’ll have to hit the “Report” button to repeat their job again. Spellsurge or 81 Healing? It’s a common question that many healers have asked themselves. This AddOn swaps weapons based on your current amount of mana, to maximize mana efficiency. With this mod, you can start fights with a high intellect staff equipped, then switch to a +damage/healing weapon for most of the fight, and then switch to a spirit-heavy staff when your mana is low. This AddOn is unique because is does all this automatically, and without interrupting you with a weapon-swap cooldown. Normally when you equip weapons in combat, you get a 1.5-second global cooldown. CasterWeaponSwapper gets around this by swapping weapons only when you start to cast a spell. This means the cooldowns overlap and you don’t experience any interruption. When out of combat, there is an option to swap weapons whenever necessary, since there is no swap cooldown. The AddOn supports 1- and 2-handed weapons, off hand items, and wands/librams/idols/totems. You can set up weapon sets for high mana, casting, low mana, and sets for Druid forms. The casting set will only be used when in combat. 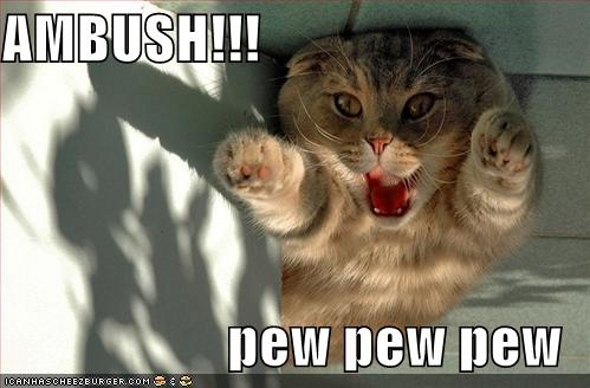 The Druid sets will be used while you are shapeshifted into a bear or cat. There is also an option to use the low-mana set while you have spirit boosting buffs (Spirit Tap, Evocation, Innervate, and Aura of the Blue Dragon), and an option to swap between a secondary casting set to proc the Spellsurge enchant each time it is available. Once you’ve downloaded and unzipped CWS to your Addons folder, you can start using it right away. Make sure you’ve enabled it. You’ll notice each set has 3 slots. From left to right, it’s your main hand, off hand, and ranged slot (Wand, Libram, Totem, Relic). Weapon you have equipped coming into an encounter of some sort. If you want to seriously push yourself and excel, this is a kind of weapon which has a ton of intellect on it. Higher intellect means larger initial mana pool. This is reserved for a weapon that you will use most of the time while casting in combat. Most of the time, it will have high MP5. When you get low on mana, CWS will automatically equip this. Now, there’s 2 ways you go about it here. You can equip a high Spirit weapon and sit still for a few seconds while your slowly regen your mana or equip another high MP5 weapon so you can continue to cast while having low mana. I’d say 9 times out of 10, if you’re running low on mana during a raid, it’s at a critical point where you have to keep pumping out heals and you can’t remain idle for too long. This is reserved for your weapon that has Spellsurge on it. The addon keeps track of Spellsurge’s internal cooldown and swaps accordingly when it’s up. You can use the sliders below to change the threshold to swap weapons. These are the default settings. For example, when my mana reaches 80%, it will switch from my High Mana set to my Casting set. When I get to 25% mana, it will switch from my Casting set to my Low Mana set. Use the sliders to control when you want that to happen. Enable swaps: Self explanatory. Either turns on or disables the entire swap mechanic. Print swaps: It notifies you in your chatbox whether or not it’s switching weapons. It tells me a few important things like how many times Spellsurge procced and the amount of time I was in the 5SR. Swap Whenever Needed…: Also self explanatory. It can handle swapping operations outside of combat. My guess is that it defaults to high mana or low mana depending on your current mana pool. It’s a top notch addon and one that I’d heartily recommend to any healer who wants to excel at their game and ensure they have the mana they need to heal their tanks. It allows me to focus on healing instead of manually switching to my Spellsurge staff to activate it and back again. I can tell you I’m not the only blogger who feels this way (Speaking of which, it’s been a week and a half, where have you been? ).